The City of Zurich provides households in booming residential areas with tailor-made information regarding mobility. The residents highly appreciate the mobility information folder; they value the contained information and like the layout. Zurich continues to grow and grow. Apart from office buildings, big housing developments are being erected, especially at the periphery of the town. This is the why the City of Zurich decided to provide "mobility management for residential areas“. It informs residents about their options with regard to different means of transportation and sustainable mobility. The main targets of the campaign are new residents, due to the fact that they might change their mobility behaviour more easily and are more receptive to appropriate mobility information when they change their place of residence. "Mobility management for residential areas" is part of the mobility management of the City of Zurich and is based on the mobility strategy of the city. The mobility information folder is a product of area-specific mobility management. It is prepared separately for each residential area and contains an area-specific mobility plan as its core element. It contains important information regarding public transport (lines, stops, time table information, etc), pedestrian and bicycle information (road networks, recommended routes, Bike&Ride offers, etc), CarSharing information (locations, etc) and various area-specific facilities. The mobility information folder is complemented with the area-specific "City Stroll“ (a map with footpaths and comments about noteworthy and historically interesting facilities) information about other municipal offers (e.g.>City mobility plan, online route planner for pedestrians and cyclists). Offers from external partners are provided as links. The format of the information folder is easy to handle and has a pleasing design. In 2008 the mobility information folder was distributed for the first time in Zurich-Affoltern in around 2000 households in newly developed residential areas. During the following year a slightly amended version of the folder was distributed to all households (12000) in Affoltern and was well appreciated by the residents. After a survey among the residents the content of the folder was slightly modified. 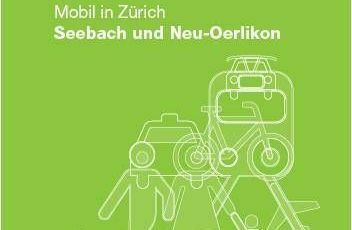 12000 households in the booming residential areas of Zurich-Seebach and Neu-Oerlikon received the mobility information folder of the City of Zurich in Spring 2011. This was accompanied by PR measures (media, information at stands, guided tours within the residential areas etc). Area-specific information about available mobility options was appreciated by the residents. The information folder was deemed to be useful and informative with a nice layout. Due to this positive feedback, the city intends to further distribute the folder in additional residential areas. The information, for those households that have already received it, is updated every two years. Mobility management is an important part of urban transport policy. The City of Zurich feels an obligation to provide citizens with area-specific mobility information as a part of its overall mobility management.